Public participation spaces to which the legislative sector “invites” citizens are not always accessible to those concerned, nor effective. But there are a variety of ways in which citizens can make themselves heard. A good example of how the public can get involved in the work of the legislature will be when Parliament invites public inputs on South Africa’s Climate Change Bill, which the Department of Environmental Affairs (DEA) is currently working on. Over the past month, the department has held provincial consultations with the public and invited submissions on the draft legislation by 8 August to inform a revised version of the document. This illustrates another way in which citizens can take part in shaping key legislation. This “how-to guide” is an overview of how to be an active citizen for responsive legislatures, by participating in the different stages of the parliamentary cycle. These are described in more detail in a newly released Action 24 booklet. Attend a public hearing: These events are held when parliamentary committees seek to engage with the public on a particular issue, or with a specific segment of society which might be affected by proposed legislation. A schedule of these hearings should be found on the provincial legislatures’ websites. Make a submission: Submissions allow members of the public to present their views or opinions on a matter or a piece of legislation under consideration by a legislature. This is an important way to provide input directly into the work of the committees – and ultimately, influence decision-making by the legislatures. Anybody may present a submission in writing, and request the opportunity to present orally to a committee. 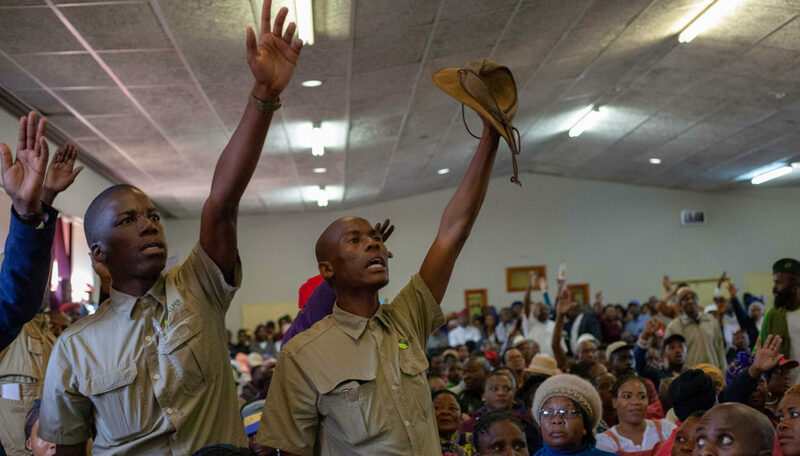 For instance, as part of the consultation on Section 25 of the Constitution, the parliamentary Constitutional Review Committee invited members of the public to make written submissions on “the necessity of, and mechanisms for expropriating land without compensation”. The process also foresees the possibility for members of the public to make oral submissions in Parliament from 7 to 17 August. Lodge a petition: Petitions are formal, written requests whereby members of the public ask a legislature to intervene in a matter. They can be either a complaint or a request for assistance with a specific issue, for instance in service delivery or air pollution. It is worth noting that, as for submissions, Parliament or a provincial legislature will only consider petitions on matters of its competence or matters for which the corresponding sphere of government is competent. Schedules 4 and 5 of the Constitution dictate the distribution of “functional areas” between national, provincial and local levels of government. The legislator has the task to review and respond to petitions, provided that they meet the minimum requirements in terms of form and content. Each legislature normally provides information to the public on the procedure to lodge petitions. Attend sittings of the House or meetings of parliamentary committees: This is a way to hear first-hand what is being said and by whom during these sessions. Attending these meetings is mostly a informative form of participation, as the public cannot voice their opinion. It can also be time and money-consuming in terms of transport, which creates a challenge for citizens living far from the legislatures’ premises, or for those with professional or family obligations clashing with parliamentary meetings schedules. Nonetheless, attending parliamentary sessions has its importance. It’s a way for the public to gain clarity on the work of their elected representatives, and to assess the extent to which they are indeed being represented as they wished. Attending these meetings therefore contributes to the citizens holding their representatives to account. All meetings of the Parliament, provincial legislatures and their committees are open to the public, unless there are reasonable and justifiable grounds for denying public access (issues of national security, for instance). While finding out about the legislatures’ schedules can prove to be challenging, citizens should not hesitate to contact the legislatures directly to request that information. Attend sector parliaments or programmes like Taking Parliament to the People (TPTP) and Taking the Legislature to the People (TLTP): The legislative sector has several programmes aimed at increasing participation of groups with specific interests (workers, youth, women, senior citizens, persons with disabilities, etc.) and making the legislatures more accessible to the communities. Sector Parliaments are organised once a year, at the discretion of Parliament and each provincial legislature. The Women Sector Parliaments, for instance, traditionally take place during August. TPTP and TLTP are other programmes run by the National Council of the Provinces and some provincial legislatures, whereby committee or plenary sessions are held in various locations outside the legislatures’ premises. These programmes intend to help bridge the gap between the people and these institutions, and usually target communities outside of main urban centres. They are supposed to take place at least once a year. However, communication about the sittings on the legislatures’ websites or on media channels is usually not efficient enough to allow for open, inclusive public participation. Get involved in oversight activities: Throughout the yearly parliamentary cycle, the legislatures review various documents as part of their oversight of the executive power: Strategic Plans, Annual Performance Plans, Annual Budgets, Quarterly and Annual Reports, etc. Public input is essential to guarantee that the legislature objectively monitors and assesses the information provided by government, and follows up on recommendations made. The public may also request and seek involvement in oversight visits and targeted studies. This can be done through submissions. Another key avenue for citizens’ engagement is through our elected representatives! While this may seem obvious, we have found that these interactions are much less frequent than they should be, particularly in the provincial legislatures. Members of Parliament and of the provincial legislatures carry out a significant part of their work at the legislatures, through the work of committees and plenary sessions. But they have an equally important responsibility to engage directly with the citizens. The parliamentary programme reserves specific time for that: every Monday when Parliament is in session, and during constituency periods – several weeks during the year reserved for elected representatives to concentrate on constituency work. During these periods the representatives make themselves available to the public, help solve problems, and report back to their constituents on what is happening in the legislature. The parties represented in the legislatures receive an allowance to run Parliamentary Constituency Offices to facilitate interaction between elected representatives and their constituencies. It is estimated that there are about 350 of these throughout the country. Despite this, very few of us know these structures even exist, and the information about their location and the members assigned to each of them is scarce, although these offices are funded by the public purse. Back in 1969, Sherry R. Arnstein warned that “there is a critical difference between going through the empty ritual of participation and having the real power needed to affect the outcome of the process”. As a matter of fact, these public participation spaces to which the legislative sector “invites” us are not always accessible to those concerned, nor effective. Protests like the ones that took place in the North West province in April this year are a clear manifestation of the frustration of not being heard. There are multiple forms of “invented” public participation through which citizens attempt to set the agenda, fortunately not always in a violent fashion. They contribute to tilt the balance of power closer to the people when institutional processes are failing. 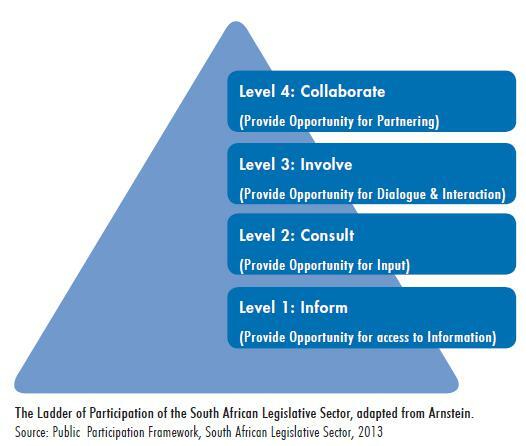 In its own adaptation of Arnstein’s “ladder of citizen participation”, the South African Legislature promotes a “best fit approach” that ranges from information to consultation, involvement, and ultimately, collaboration. With each level comes increased opportunities for public input to influence or impact the decision-making process, with collaboration being the most participatory form of governance. In this approach, the level of public participation processes is determined based on the level of public interest. The Constitution and several Constitutional Court rulings spell out what is required to ensure that public participation in the legislative and oversight processes is indeed meaningful, effective and inclusive. One of the key criteria is that consultations should include the groups who may be affected by the decisions/actions under consideration, and they must be consulted before a final decision has been made. Also, the public must be informed in a language that they understand and can engage in, and given enough time to prepare for consultations. With a background in political science and human rights advocacy, Noelle Garcin has been working with the African Climate Reality Project since 2016 on growing the mobilisation in Africa to tackle climate change. This article was produced with the financial support of the European Union. Its contents are the sole responsibility of the implementing organisations and do not necessarily reflect the views of the European Union.